On board Durga 2 discover the secrets of the unique and special mangrove-lined water way of the Cumbharjua Canal in the three-hour cruise. Relax and enjoy during the river cruise the thriving and vibrant mangrove habitat which serves as spawning ground for fish, prawns, mollusks and a marine-life-rich ecosystem that sustains a healthy population of birdlife and crocodiles. 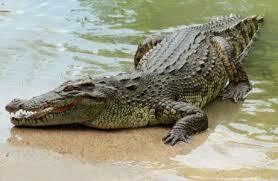 Crocodile trip in Goa as a part of Mandovi River Cruise is something you are sure to remember with great delight!